A Wheaton man is accused of setting small fires in the stairwells of three Streeterville high-rise buildings last week, including Northwestern Memorial Hospital and the Ritz-Carlton Hotel, according to court records. No one has been injured. Andrew D. Jones, 28, is currently held in lieu of $1,000 bail. 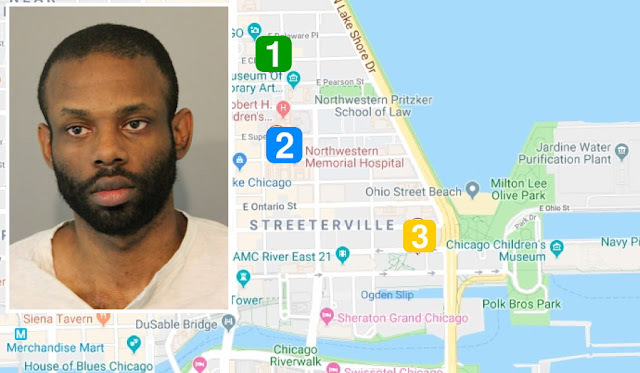 On Jan. 19th, Jones was detained by Northwestern Memorial Hospital security after he allegedly started a small fire in a stairwell of the hospital at 201 East Huron around 8 p.m. Police said Jones admitted to setting the fire, which caused a worker to pull a fire alarm and the entire hospital to be placed on lockdown, according to court records. Jones was charged with misdemeanor reckless conduct and misdemeanor criminal trespassing. He was released on a recognizance bond. Two days later, police and fire personnel were called to the Ritz-Carlton, 160 East Pearson, at 12:30 p.m. after an employee found and extinguished a small fire in a stairwell between the 11th and 12th floors. Jones, who was known to hotel security, was located nearby and held for police. Police officers said they found six disposable lighters in his possession. Prosecutors charged him with felony criminal damage to property, misdemeanor trespassing, and two misdemeanor counts of reckless conduct-bodily harm. Police officers at the hotel thought the fire sounded similar to a Jan. 14th incident in the One Bennett Park residential high-rise at 514 North Peshtigo Court. An investigation was launched, and Jones has now been charged with criminal damage to property and reckless conduct-bodily harm in connection with that case. Jones is due back in court on Feb. 8th. He can go free to await trial by posting a $100 deposit.